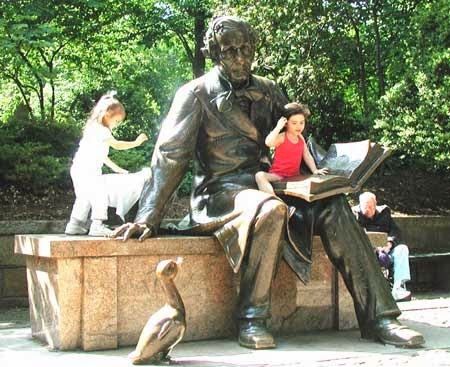 Hans Christian Andersen's theatre fascination began with an introduction using the puppet stage his father made. At the risk of revealing too much from today's story, theatre directors will appreciate the Puppet-Show Man's choice of a suitcase full of puppets over actors. Because the Great Lakes Regional Festival, Motor City Puppet Blast, is next month at the Detroit Institute of Arts, this month looks at PUPPETS! 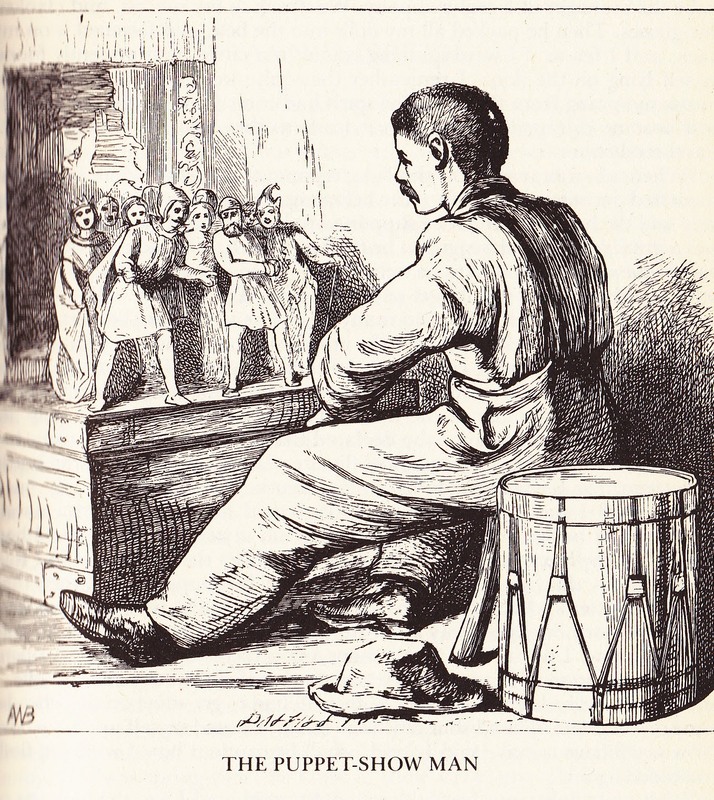 To include stories in this blog's Keeping the Public in Public Domain, I'm convinced the best story on the topic is Andersen's "The Puppet-Show Man." While children can follow the simpler outline of the story's basics, like so many of his writings there is much for adults in the work, including autobiographical elements. The stories depend on translation to bring the Danish author to English speaking audiences, whether reading or hearing the stories. 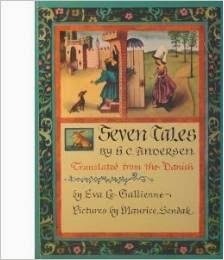 Amazon books have 101 pages of Andersen books. My favorite interpretations are by the actress Eva Le Gallienne, but she only translated seven of his more than 150 stories. 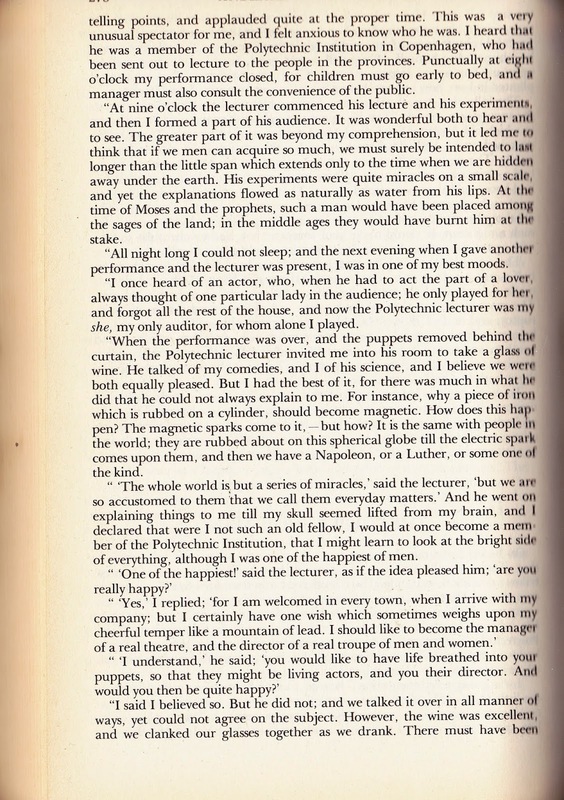 Added to that, while Andersen died in 1875, the translations I must show here need to be in the Public Domain for more than just my usual desire to keep older stories alive. As I mentioned nearly a year ago when featuring an Andersen story, I encourage you to compare many of them before telling something by him. Just as I did then, I turn to the translation by Mrs. H.B. Paull because her work is safely within the Public Domain and covers the largest number of his stories. At the same time even her first and middle name is debated, as Susannah Mary Paull or as Margaret Agnes Paull. While her work interpreting both Andersen and Grimm is well known, she wrote much more that now is nearly as obscure as her name. Modern scholarship examines her work in the book, Voices in Translation: Bridging Cultural Divides edited by Gunilla Anderman. The chapter, "Little Snowdrop and the Magic Mirror: Two Approaches to Creating a 'Suitable' Translation in 19th Century England" by Niamh Chapelle and Jenny Williams contrasts Paull with the popular Victorian writer, Dinah Mulock, who was later known as Mrs. Craik. 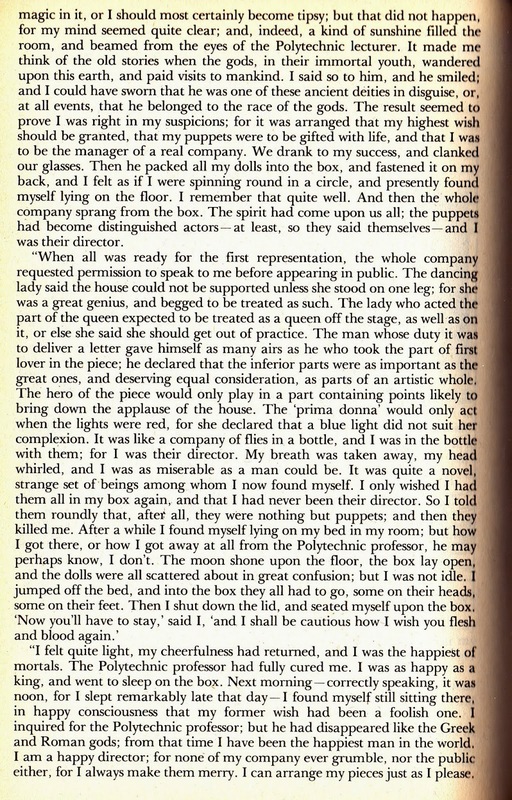 The story of "Little Snowdrop and the Magic Mirror" is from the Brothers Grimm. Chapelle and Williams analysis of the two translators faults Paull for being moralistic both in her choice of words and omissions. They aren't looking at her work with Andersen, but still would probably have a similar opinion. 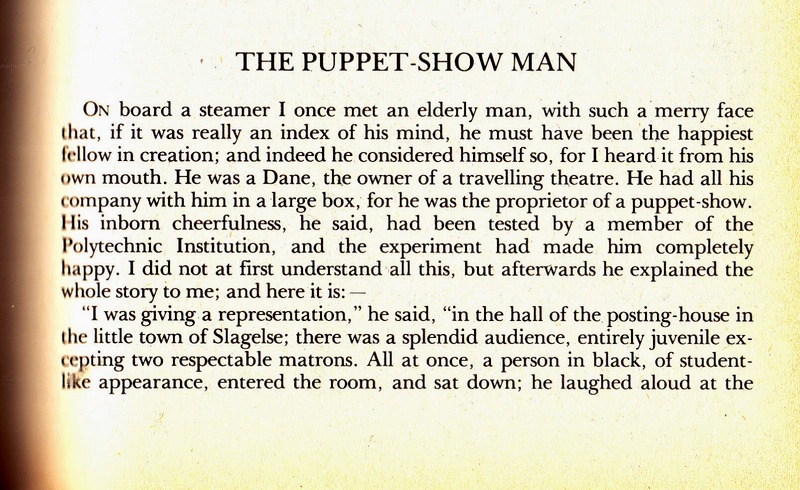 Unfortunately "Puppet-Show Man" is not one of Andersen's better known works with a large number of versions to compare. When I did look at others, the differences felt minor. By the way, blogs place the most recent article first, but all this month, if you haven't yet read the start of this month my article "A to Z, Puppets Are Easy", which began this month, be sure to catch it.